A permanent resident card, or "green" card, is the documented proof that you are a U.S. permanent resident, so a green card must be permanently valid, right? Probably not. Although some older green cards have no expiration dates, most current permanent resident cards are only valid for 10 years. 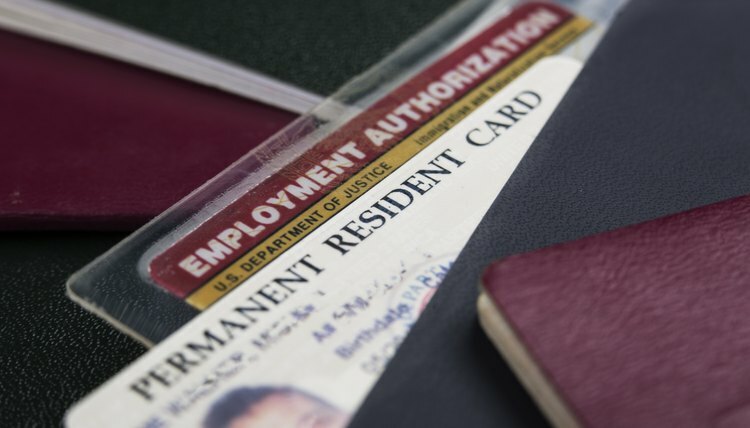 Ten-year green cards may be renewed within six months of the expiration date. Conditional permanent resident green cards are issued for two years. These cards may not be renewed. To remain a permanent resident, a person with a conditional card must file a petition to remove conditions on the green card within 90 days of its expiration. Permanent residents who are 18 years old or older are required to have a valid green card with them at all times. Although green cards issued between 1979 and August 1989 do not expire, most permanent resident cards issued after August 1989 must be renewed every 10 years. However, for those who obtain resident status through marriage or through an entrepreneur-based investment, a conditional two-year green card may be issued. There is no two-year green card renewal, but instead, the conditions must be removed for the holder to maintain permanent resident status. All permanent residents are entitled to the same rights and privileges whether they are issued a 10- or a two-year green card. Permanent residents can renew their 10-year green cards within six months of the card’s expiration date. Start the process by filing Form I-90, Application to Replace Permanent Resident Card by mail or online. Form I-90 can be found on the U.S Citizenship and Immigration Services website. All relevant sections of the form must be completed and signed or USICS will reject the application. Along with the application for renewal, you must provide additional documentation. For all renewals, you must include a copy of your expired or expiring green card. If your name or other biographical information, such as height, weight, eye color or hair color has changed, you must submit copies of the appropriate legal documents, such as a registered copy of a marriage certificate, divorce decree or adoption decree showing new or changed biographical data. There is a $455 filing fee for permanent resident card renewals, as well as an $85 biometric services fee. If you are unable to pay the filing fee, you may be eligible for a fee waiver and should submit Form-I-912, Request for Fee Waiver, along with your Form I-90. If you are applying for a fee waiver, you must submit your application by mail. Your Form I-90 must be accepted by the USCIS before it is considered properly filed. Acceptance is simply an acknowledgment that your form was received. After acceptance, USCIS will examine the form to ensure it is complete. Incomplete forms may be rejected or denied. The USCIS may request more information or evidence in support of your application for renewal or ask for originals of any documentation. Likewise, the USCIS might request an interview, fingerprints, photograph or signature to confirm your identity or to update your background and security checks. After review, the USCIS will notify you of the renewal determination either in writing or, if you filed online, through an online notification. You can check the status of your application online at the USCIS website or by phone at 800-375-5283. If your application is denied, there is no appeals process. However, you can file a motion asking the USCIS office to either reopen or reconsider its decision. A motion to reconsider must show that the denial was due to incorrect application of the law or immigration policy. A motion to reopen should provide new facts and include supporting documentation. What Is a Conditional Permanent Resident Card? Conditional green cards are valid for two years and are issued in two instances: First, if you apply for a green card based on marriage to a U.S. citizen and you have been married for less than two years, you may be granted conditional resident status. Second, conditional resident status may be granted based on an investment in a new commercial enterprise that will benefit the U.S. economy and create at least 10 full-time positions. Conditional green cards may not be renewed, but instead you must file a petition to remove the condition within 90 days before the card expires. Who May File a Petition to Remove Conditions? To remove conditions from your marriage-based, two-year green card, you must file with the USCIS Form I-751 Petition to Remove Conditions on Residence. If you remained married, then you and your spouse should file a joint Form I-751. You should include in your petition any dependent children who acquired conditional resident status at the same time as you. If your dependent children acquired conditional resident status more than 90 days after you, or if you are a dependent child whose resident parent has died, then the dependent child must file a separate Form I-751. If you entered the marriage in good faith, but your spouse died. If you entered the marriage in good faith, but the marriage was dissolved through annulment or divorce. If you entered the marriage in good faith, but your spouse battered you or subjected you to extreme cruelty. If you are a dependent and your conditional resident parent entered the marriage in good faith, but you have been subjected to extreme cruelty or battered by one of your parents. If the termination of your status and subsequent removal from the country would result in extreme hardship. If you are filing a Form I-751 jointly, you must file it within 90 days of the conditional residency expiration date. If you are filing Form I-751 with a request that the joint filing requirement be waived, then you can file the petition at any time from when you are granted conditional resident status to when the two-year period ends. If you do not file a petition before your conditional green card expires, you will lose your permanent resident status and may be deported from the United States. Fill out the form completely, including your signature. USCIS will reject unsigned forms. Submit the form, along with the required initial evidence, by mail to the USCIS address that corresponds to the state where you live. Check the USCIS website for the correct address. There is a $595 filing fee and an $85 biometric service fee. Each person applying to remove conditions on the same Form I-751 must submit a biometric fee. Each petition must include certain supporting documents and evidence. All Form I-751 petitions must include copies of the front and back of your permanent resident card and copies of the cards of any conditional resident children included in the petition. Birth certificates of children born while you were married. Lease or mortgage documents proving you lived together. Sworn affidavits from at least two people who can attest to your relationship. If you are filing after the death of a spouse, you must also include a copy of the death certificate. If you are filing as an individual because of divorce or annulment, you must submit a copy of your final divorce decree or annulment document. If you are the victim of battery or extreme cruelty, you must submit evidence of the abuse. If you are filing due to extreme hardship, you must include evidence that your removal from the United States would result in such hardship. If you are a child filing separately from your parent, you must provide an explanation with supporting documentation. You must provide evidence of any criminal history, even if you were not charged or arrested. To remove the conditions for investor/entrepreneur-based conditional permanent resident status, you must file a Form I-829 with the USCIS. You may also include your spouse, former spouse or children in this petition. The petition must be filled out completely and include your signature. File the Form I-829 petition, along with all evidence and supporting documentation and the correct filing fee. The filing fee for this form is $3,750, as well as an $85 application fee for each person included in the petition that is between 14 and 79 years old. Copies of your permanent resident card and copies of the cards of those included in your petition. Evidence of your investment and job creation. Evidence of any criminal history. What Happens After Filing a Petition to Remove Conditions? Just like with the Form I-90, after filing either Form I-751 or Form I-829, the USCIS must accept your petition. After acceptance, the petition will be checked for completeness. If the form is complete, the USCIS may request additional evidence or information or request an interview. Finally, the USCIS will determine whether you have proved that you are eligible for the removal of the conditions. After filing, but while your status is still pending, your conditional green card will automatically renew for one year. Your acceptance receipt is the proof that your status is pending and you must carry it along with your permanent resident card until a decision is reached. If the USCIS denies your petition, your conditional permanent resident status is terminated and you may be deported from the United States. If your petition is approved, you are granted permanent resident status and will be issued a green card renewable after 10 years. USCIS: I-829, Petition by Entrepreneur to Remove Conditions on Permanent Resident Status. Brooks, Sally. "How Long Is a Green Card Valid?" , https://legalbeagle.com/5285245-long-green-card-valid.html. 08 March 2019.